more good will be expected"
Records show that the first chemical investigations in Serbia were done by apothecaries in the 18th century. The first book published in Serbian language concerned with the issue of laboratory diagnostics was entitled Qualitative Urine Analysis and it was written in 1877 by Dr Jovan Djurić, a Master of Pharmacy. Before higher education became available in our country, laboratory experts were mostly schooled at the Faculties of Pharmacy in France. This is why the university education of laboratory professionals that was later introduced in Yugoslavia was primarily associated with Pharmaceutical Faculties. Namely, Physiological Chemistry, i.e. the chemical-biological analysis of urine, blood, feces etc., was included as a subject in the initial curricula of these faculties, and the subject Medical Biochemistry with Exercises (a synonymous expression for clinical chemistry) soon followed. For a long time, the professionals working in clinical biochemistry laboratories were educated under a common curriculum at the Faculty of Pharmacy, where employees needed in pharmacies and the pharmaceutical industry were schooled. Today, a five-year university curriculum is available to medical biochemists (Master of Pharmacy - Medical Biochemist), independent of the general profile of the studies (Master of Pharmacy). Data about the development of Medical Biochemistry in this region go further back. Towards the end of the 11th century, Serbian national culture began to form, and this process that started at the monastery Studenica would continue in the Serbian monastery Hilandar in Mount Athos. In this period, contemporary European medicine was also introduced in Serbia, which had evolved under the influence of the Italo-French medical schools of Salerno and Montpelier. This progress started in the 13th century and continued well into the 15th century, when Serbian medieval medicine reached its climax. During this time, the works of the most prominent authors from these schools were translated into Serbian. Around the middle of the 16th century, the Hilandar Medical Codex was created, which is the richest resource for the study of medieval Serbian medical terminology. Among other things, the Codex contains texts about diagnosing diseases by observing changes in urine. This is a rather extensive record, listing theoretical viewpoints on urine and its changes, as well as practical instructions for its use in diagnostics. This suggests that the beginning of the development of Serbian laboratory diagnostic coincided with the worldwide evolution of this branch of medicine. Intensive growth came in the 19th and the beginning of the 20th century. Between the two world wars, this country witnessed the work of many clinical laboratories. The professionals working in these laboratories were mostly physicians who were helped by laboratory technicians, rarely pharmacists or chemists. None of them had completed any form of specialization and most were self-taught. At the time, only the clinical laboratories of major military hospitals employed a handful of pharmacists – medical biochemists – who upon graduating in pharmacy were awarded military scholarships and sent to France to specialize in clinical chemistry. The first Serbian medical biochemist who studied and actually specialized in clinical chemistry was Miloš Jančić, and he later exhibited a strong influence on the development of medical biochemistry in our country. He was Head of the Biochemistry Laboratory at the Military Hygienic Institute (at the time, Chief Military Hospital in Belgrade). This laboratory saw a significant number of pharmacists and physicians during their military service, who would gain solid practical knowledge in clinical chemistry from Miloš Jančić. Among others, Stevan Lukić, Vojislav Marjanović, Jovan Tucakov, Pavle Trpinac and Aleksandar Sabovljev should be mentioned here. After the Second World War, an organized laboratory service became a legal prerequisite for establishing and opening a health care institution. Thus, an organized clinical biochemistry laboratory service is today part of all health care institutions. In this way, many laboratories with various types of technical equipment and different levels of employees’ education were formed in the post-war period. Section for Medical Biochemistry was organized as far back as 1951, as part of the Pharmaceutical Society of Serbia. This suggests that medical biochemistry in this region developed in parallel with the rise of this discipline worldwide. 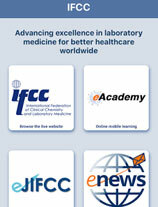 Namely, the International Federation of Clinical Chemistry (IFCC) was founded in 1952. Right after the Second World War, our medical biochemists began to form their professional societies. Even before 1950, laboratory experts would meet at the Pharmaceutical Society of Serbia, among whom Professor Dr Aleksandar Damanski, Professor Dr Momčilo Mokranjac and Docent Dr Pavle Trpinac were especially active in the fields of bromatology, toxicology, and biochemistry, respectively. At a session of the Managerial Board of the Association of Pharmacists of Republic of Serbia, held on 22 December 1950, the issue was raised of establishing a section that would gather laboratory professionals. Section for Sanitary Chemistry that included all three profiles of laboratory professionals – medical biochemists, sanitary chemists and toxicologists – was formed on 1 January 1951. The Section’s management included Professor Dr Pavle Trpinac and Master of Pharmacy Ljubomir Purać as the representatives of the medical biochemists of Serbia. Later, this section evolved into the Section for Medical Biochemistry, whose first president was Professor Dr Pavle Trpinac. Medical biochemistry sections of the Pharmaceutical Societies in other Republics followed suit. The members of these sections were actively engaged both in their respective Pharmaceutical Societies, and in the later formed Society of Medical Biochemists of Yugoslavia. Medical biochemistry is often regarded as a relatively young discipline, considering that its sudden growth came in the aftermath of the Second World War. The fact that the first professional societies and journals related to this field appeared after 1940 also supports this view. After the establishment of national societies of clinical chemists, Professor E. J. King of the Royal Postgraduate Medical School in London led an initiative in 1952 to join the national associations of clinical biochemists that was supervised by the International Union for Pure and Applied Chemistry (IUPAC). A year later (1953) in Stockholm, the name of this newly formed association was changed into International Federation of Clinical Chemistry, which was officially accepted on 25 September 1954, during the First International Congress in this field held in Amsterdam (under the title International Congress of Clinical Chemistry). The Federation’s first president was Earl J. King. At the 6th Plenary Session of the Alliance of Pharmaceutical Societies of Yugoslavia (APSY), held on 15 May 1955 in Split, a decision was made to form the Section for Medical Biochemistry within the APSY. Section for Medical Biochemistry within the APSY was renamed Society of Medical Biochemistry within the APSY, by decision of the 16th Plenary Session of the APSY, held on 15 May 1965 in Banjaluka. Accordingly, on 6 April 1995, the Society of Medical Biochemists of Yugoslavia (SMBY) decided, on the basis of historical records, to declare 15 May as the Day of the Society of Medical Biochemists of Yugoslavia. Since the founding of the International Federation of Clinical Chemistry (IFCC) within the IUPAC, medical biochemists from our country have actively joined this organization. 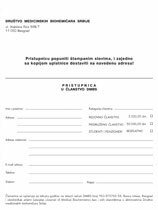 Significant roles in all these activities were taken on by Professor Dr Marijana Fišer-Herman and Primarius Tatjana PlećašDrljača, who was also the first president of the SMBY and served two mandates, from 13 March 1965 until the year 1973. During her presidency, in May 1971, the SMBY became the 28th member of the IFCC. This significant piece of news was announced by Tatjana Plećaš-Drljača while greeting the participants of the Third Congress of the SMBY held in 1971 in Bled. In its past, the Society underwent a series of transformations in its organization and its title. Today, the Society of Medical Biochemists of Serbia (SMBS) is a social, voluntary, and autonomous professional organization of the medical biochemists of Serbia, whose goal is to advance public health through clinical biochemistry laboratory diagnostics by implementing contemporary achievements in medicine and other related scientific fields, as well as to influence the development of scientific work and the promotion and organization of health protection in its domain of the health care system of the Republic of Serbia. The title of the organization is DRUŠTVO MEDICINSKIH BIOHEMIČARA SRBIJE (DMBS). For relations with foreign countries, the accepted title in English is: Society of Medical Biochemists of Serbia. The SMBS is registered as a professional scientific organization with the Ministry of Science of the Republic of Serbia. 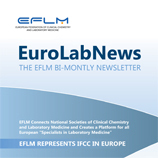 The SMBS is a member of the International Federation of Clinical Chemistry and Laboratory Medicine (IFCC), a leading international organization in the field of Clinical Chemistry (here also Medical Biochemistry), the European Federation of Clinical Chemistry and Laboratory Medicine (EFLM), and the Balkan Clinical Laboratory Federation (BCLF). The aim of the SMBS is to bring medical biochemists together for the purpose of promoting and developing all the specialties of medical biochemistry in health care. The tasks of the Society include the regulation of working standards in clinical biochemistry laboratories, education of medical biochemists at all academic levels, instigation of scientific investigation, definition of work norms and implementation, application and adherence to the codes of ethics of health care workers. The standards established in the field of medical biochemistry are suggested by the SMBS to relevant institutions of the Republic of Serbia. The Society is also responsible for enabling an exchange of experiences to its members with their peers from related organizations in the country and abroad. The Society of Medical Biochemists of Serbia will mark its 60th Anniversary on 15 May 2015 in Belgrade by hosting the 11th EFLM Symposium for Balkan Region, entitled Laboratory Medicine Specialist Focuses on the Patients Wellbeing, in collaboration with the European Federation for Clinical Chemistry and Laboratory Medicine (EFLM) and under the auspices of the International Federation for Clinical Chemistry and Laboratory Medicine (IFCC) and the ministries of Health and Science of the Republic of Serbia. 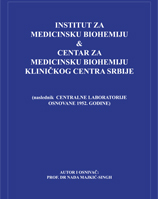 The accepted date of the formation of the Society of Medical Biochemists of Yugoslavia (today, Serbia) notwithstanding, we should emphasize that Serbian medical biochemists have a much longer tradition of practicing this diagnostic branch, that is described in monograph symbolically entitled SERBIAN MEDICAL BIOCHEMISTRY IN THE 21ST CENTURY – 70 YEARS LATER. The Society of Medical Biochemists of Serbia hosts congresses, Biochemistry Days, seminars, News in Laboratory Medicine and other events on a regular basis, all of which are dedicated to continuous medical education of its members and knowledge innovation. So-far, a total of 20 congresses and 20 seminars sessions have been held. 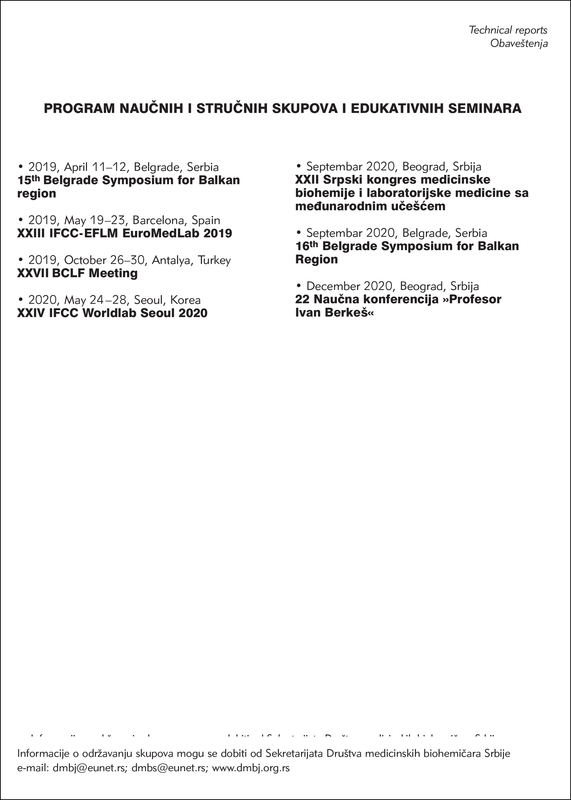 As a member of the Balkan Clinical Laboratory Federation (BCLF), the Society has organized three BCLF congresses: the 4th Congress in Budva in 1996, the 11th Congress in Belgrade in 2003, and the 20th congress in 2012, also held in Belgrade. Each year, together with the EFLM and under the auspices of the IFCC and the BCLF, the SMBS organizes an international symposium entitled EFLM SYMPOSIUM FOR BALKAN REGION, dedicated to current topics pertinent to the promotion of this profession. Thus far, the SMBS has organized thirteen EFLM symposia. The SMBS issues a number of regular and occasional publications for the purpose of informing medical biochemists in the country and abroad about specialist and scientific achievements in the field of medical biochemistry. The content of these occasional publications is defined by the Executive Board of the SMBS upon suggestion by the Publishing Committee. The Society also publishes the Journal of Medical Biochemistry. In order to keep its members and the wider social network informed about its scientific activities, the Society posts regular updates on its official web-site www.dmbj.org.rs. The Society of Medical Biochemists of Serbia has established two funds, "Professor Ivan Berkeš" and "Magistra Milica Marković". In appreciation of the work of its teacher and distinguished expert, in 1997 the Society of Medical Biochemists of Yugoslavia and the Faculty of Pharmacy of the University of Belgrade set up the Scientific Fund "Professor Ivan Berkeš" as well as an annual scientific conference dedicated to the life and work of Professor Ivan Berkeš. The scientific fund was formed upon suggestion by Professor Dr Nada Majkić-Singh, who is also the long-time organizer of these annual scientific conferences. The fund presents the results of master and doctoral dissertations of Society’s members and gives awards and diplomas to the best students of the Faculty of Pharmacy. To honour the extraordinary and lasting contribution of Milica Marković to the scientific advancement of medical biochemistry, in 2012, following the initiative of her closest co-workers and friends, the Society of Medical Biochemists set up the Fund "Magistra Milica Marković" to remember this great scholar, one of the best Serbian biochemistry magisters, outstanding biochemist and devoted laborer in practical clinical biochemistry. The fund has established a dedicated annual award "Magistra Milica Marković" to be given to clinical biochemists or laboratories for improving the technological and organizational work principles of clinical laboratories, to an individual or team for their exceptional professional engagement related to the work and organization of laboratory service with the goal of maximizing the quality of laboratory service, for advancement of the profession in accordance with the recommendations given by Milica Marković. Also, in order to pursue its goals related to expert and scientific activities, the Society of Medical Biochemists of Serbia cooperates with numerous organizations and institutions, primarily with the ministries of Health and Science, faculties of Pharmacy and Medicine, Chamber of Biochemists of Serbia, professional associations, diagnostic tools companies and other organizations. Here, specific emphasis is placed on collaboration with the Medical Biochemistry students via the Medical Biochemist Team active at the Faculty of Pharmacy in Belgrade, which is indicative of the special treatment provided to young medical biochemists. 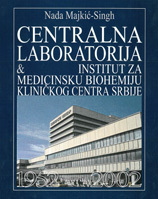 The monograph, entitled SERBIAN MEDICAL BIOCHEMISTRY IN THE 21ST CENTURY – 70 YEARS LATER, will contribute to the continuity of the monograph DEVELOPMENT OF MEDICAL BIOCHEMISTRY IN YUGOSLAVIA (written by Nada Majkić-Singh, J. Djurdjević and J. Kavarić, SMBS, 1998) which describes in detail the development of the profession of Medical Biochemist up to 1995.